I like books. I also own a lot of them. When moving recently, I realized just how many: Even after disposing of a third of my collection, I still have a couple of thousand. And boy, do they take up a lot of space—it’s one of the things that makes ebooks so attractive. On the other hand, those dead-tree books are free from one of ebooks’ most onerous encumbrances: digital rights management. That lack of DRM means I can read them wherever and whenever I want—well, as long as I have light. For ebooks with DRM, though, the publishers and retailers get to dictate how they can be used, read, and shared. I’ve embraced ebooks, in part to save on buying more shelving. But because DRM prevents ebooks from having the same flexibility as print books, I’m loath to buy them for anything more than books I only plan on reading once. But that doesn’t have to be the way it is, and Apple could lead the way to change—it’s done so in the past. It seems at times unbelievable that we’re all now used to having music without DRM, but still have books that depend on what platform we use. Granted, not all publishers or authors sell their books with DRM. As an author of several Take Control ebooks, I’m very happy that these books are not locked down. Users can purchase these books in PDF, ePub, and MOBI format, and read them on just about any ebook reader, tablet or computer. While some well-known authors and publishers sell unrestricted ebooks, such DRM-free titles remain just a drop in the ocean of ebooks. 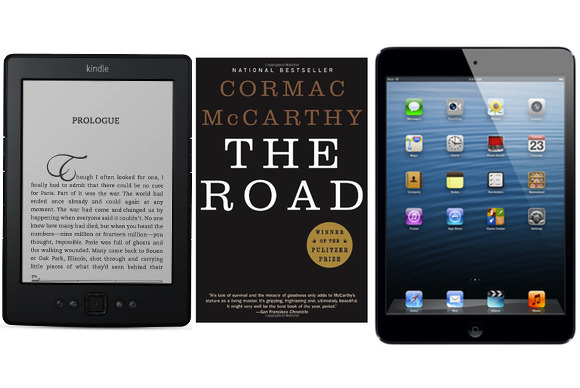 The publishing industry’s road to digital has been rocky. Amazon has long sold ebooks at a loss; in the long run, that’s changed the perceived value of books and it’s coincided with a drop in the sales of hardcover fiction. Apple’s not without blame either: the recent antitrust decision against Apple found the company guilty of colluding with five major publishers to set ebook prices, part of what seems to be a concerted effort to bite into Amazon’s market-dominant status. Of course, one of Jobs's points in that letter was that it was incumbent upon the record labels to make it possible for Apple to sell DRM-free music. Apple can’t unilaterally decide to sell ebooks DRM-free without the publishers agreeing. But Apple can—and should—apply pressure and make the case to publishers, because in the long run it will benefit Cupertino’s own customers. I can listen to my digital music files on just about any device; I want to do the same thing with my books. I can lend my music to my friend; why can’t I lend her a book I bought on my Kindle or iPad? (Amazon, to its credit, offers a lending option, but it’s so crippled and feature-limited as to barely register above “useless.”) Above all, why can’t I read any ebook on any device of my choice? I use two types of devices to read ebooks: I have a Kindle Paperwhite and two iPads (one full-sized and one mini). These devices aren’t interchangeable. Because of these limitations, I consider two variables when I want to buy an ebook: If a book is a lot cheaper in the iBookstore, I’ll get it there. But because Kindle books offer the option to be read on multiple devices—including outdoor-friendly e-ink Kindles, I generally pick Amazon’s offering, unless I’m certain I’ll be reading exclusively on the iPad. Music has lost its DRM fetters; it’s time for ebooks to do the same. But in order for that to happen, consumers need to be the ones to demand that this DRM, and the platform lock-in it engenders, be eliminated. Apple could take the lead, as the company did with DRM-free music, and help change another market that needs it. This could be good for Apple itself, too, given the perception of the company in the wake of the ebook price-fixing ruling. But above all, what should matter to Apple is that ending ebook DRM would be good for consumers. It would lead to true competition among ebook retailers, since any retailer could sell books that could be read on different devices, just as any bookstore can sell dead-tree books that anyone can read. We would be able to choose the device we want to use to read a new book. We wouldn’t have to worry about being able to access our digital libraries in the future. And the next time I move, I wouldn’t have to worry as much about how many books I’m schlepping from one home to another.